All of the pieces pictured on this page are standard 21" plates. 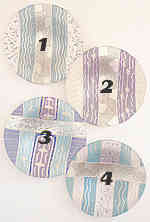 As shown in the example to the right, each card displays different designs and the specific plates are numbered 1-4 sequentially. To Order a specific plate you quote the Card No. and the Plate No. Please remember that you are viewing these images with digital technology, the real colors are much more vibrant and rich.